Cheesecake is one of those desserts that seems like it should be keto-friendly. After all, it’s just cream cheese with a little bit of sweetness, right? Unfortunately, this isn’t the case — almost every cheesecake is packed with added sugar and carb-filled flour, making this delicious dessert a disaster for our health. However, this doesn’t mean that you can never eat cheesecake again if you are on the ketogenic diet. All you have to do is make it yourself using your favorite low-calorie sweeteners, cream cheese, and the other keto-friendly ingredients that you’ll find in the low-carb cheesecake recipes below. In fact, just throw out all of the sugar in your house — you won’t need it anymore once you get acquainted with our keto recipes. Below, you’ll find a list of each individual cheesecakes and some information behind the health benefits of the recipe. Sopapilla cheesecake is a simple cheesecake that is surrounded by a sopapilla, which is a type of fried pastry. Our keto-friendly version of the sopapilla consists of pork rinds and eggs, providing a texture and flavor that goes wonderfully with the cheesecake. The main ingredient of the cheesecake is cream cheese, which, in itself, is one of the best types of cheese for ketoers to include in their diet. Why is this cheese such a staple for the ketogenic diet? Mainly because it is made up of almost 90% fat, making it one of the highest fat cheeses that you can consume. Having some cream cheese with your meal is a great way to meet your fat requirements while on you are on the ketogenic diet. Another reason why cream cheese is so valuable for ketogenic dieters is that it provides us with many health-promoting nutrients. For starters, cream cheese contains more conjugated linoleic acid (CLA) than many of the other popular types of cheese. CLA is a type of fatty acid that appears to have several health benefits and may promote weight loss in overweight individuals. Furthermore, cream cheese also provides us with vital minerals like calcium, zinc, and selenium, and vitamins B2, B12, A, and K2. Each one of these micronutrients is essential for maintaining the healthy function of the organs throughout the body. Without consuming them in adequate amounts, we become vulnerable to chronic disease and infection. 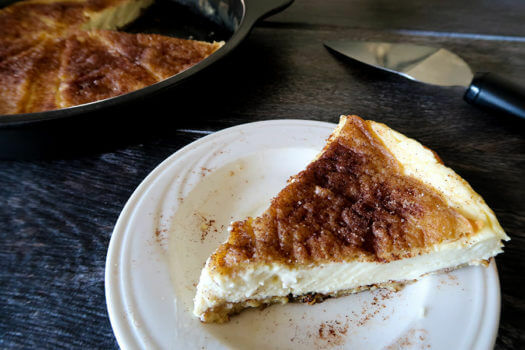 The combination of the macronutrients and micronutrients that are found in cream cheese make this cheesecake (and the other cheesecakes on this keto cheesecake list) an ideal after dinner treat or afternoon snack for every ketogenic dieter. This low-carb cheesecake will fulfill your cravings for fall flavors better than sugar-filled pumpkin pie. 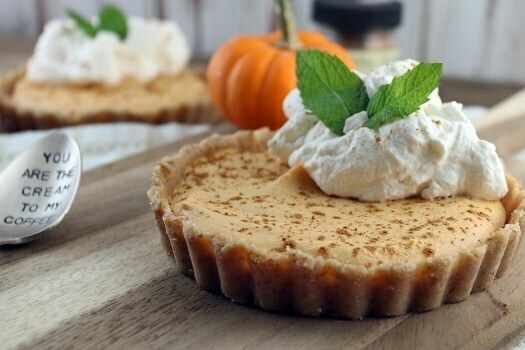 The creaminess of cream cheese and pumpkin combine flawlessly with the flaxseed meal and almond flour no-bake crust to satisfy the palate in every way. Eating this keto cheesecake will also give you a good excuse to get more nuts and seeds into your diet. Nut consumption alone is associated with a lower waist circumference, lower rates of obesity, decreased blood pressure, and healthier blood sugar and blood lipid levels. This is mainly because nuts contain vitamins, minerals, health-promoting fats, and antioxidants that make them highly satiating and ridiculously healthy. Almonds, in particular, are known for being one of the healthiest nuts because they have the highest protein, fiber, and vitamin E content of any nut that has been studied. On top of that, the flaxseeds in the crust will provide your body with lignans and fiber, which will help improve your gut and cardiovascular health even more. Altogether, this is one of the healthiest keto cheesecakes that you can make for yourself. You may not want to wait until Thanksgiving to try this one. If you need a little sour to go with the sweetness of dessert, then these key lime cheesecakes will be your new go-to keto cheesecake recipe. It is also one of the best ways to get the health benefits of citrus in your diet. Although research is still being conducted to discover the unique benefits of citrus fruits, we do know for sure that they contain vitamin C, β-carotene, flavonoids, limonoids, folic acid, and dietary fiber. The combination of these food components are thought to be the reason why a high intake of citrus fruits is associated with a reduced risk of degenerative diseases. When it comes to lime specifically, researchers have found that lime peels and lime juice contain antioxidants that can help slow down the process of atherogenesis (the buildup of plaque on artery walls). The macadamia nuts that are used in the crust of this low carb cheesecake will improve your cardiovascular health even further. This is because they contain more LDL cholesterol-lowering monounsaturated fat than any other nut. 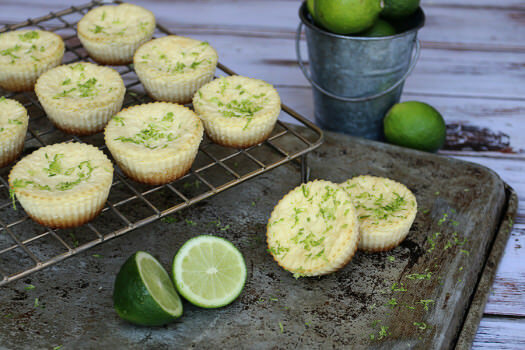 Overall, if you enjoy the taste of citrus with your dessert and would like to improve your health at the same time, then these key lime cheesecakes are perfect for you. 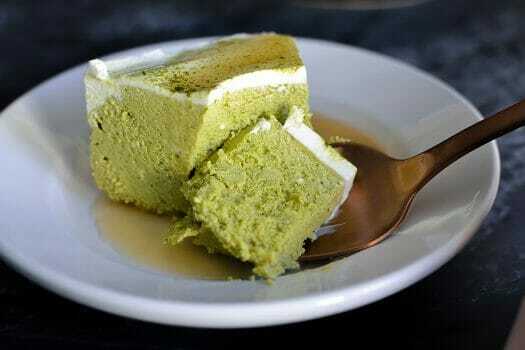 This Instant Pot matcha cheesecake is for those of you who want to eat cheesecake, but don’t want to deal with the intricate process of making it. It is also one of the most delicious keto-friendly ways to get all of the health benefits of matcha as well. Matcha is like green tea but better — much better. This is because it is derived from the same plant as green tea but cultivated and processed differently. As a result, matcha is packed with more antioxidants and caffeine which both give it the ability to reduce cell damage, improve liver health, enhance cognitive function, prevent cancer, and boost weight loss. This keto cheesecake also calls for eggs, which will provide you with a significant amount of thirteen essential vitamins and minerals and eye-protecting antioxidants like lutein and zeaxanthin. Eggs are also an excellent source of choline, a vitamin-like nutrient that’s important for liver function, normal brain development, nerve function, muscle movement, and maintaining a healthy metabolism. The matcha and eggs together provide you with many health-boosting nutrients that will support the function of your organs and organ systems as they help you lose weight and improve your body composition. In other words, when you take the sugar and flour out and replace it with keto-friendly ingredients, your cheesecake suddenly becomes healthy. Chocolate, coffee, and cheesecake, they all taste amazing on their own — but what would happen if you combine them all together? It’s everything that you hope it would be. 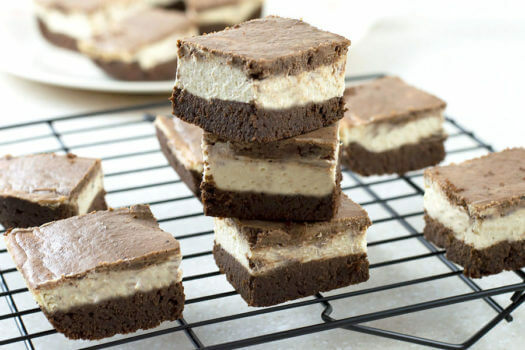 The coffee enhances the chocolate flavor, while it simultaneously brings a nice rich flavor to the cheesecake. As an added bonus, you will get an energy boost while you treat your body to the benefits of cocoa powder. More specifically, the flavonoids in the cocoa powder will serve as prebiotics and improve digestive health. Some of these flavonoids will make it into the bloodstream where they help improve insulin sensitivity, lower blood pressure, and prevent plaque from building up in the arteries. The theobromine in the cocoa powder will also work together with the caffeine in the instant coffee to give you a slight mood boost and energy buzz at the same time. This keto cheesecake is a win win win for your palate, your health, and your well-being. It’s relatively simple to use these low-carb cheesecake recipes to meet your macros. Simply tailor the portion sizes to help you meet your needs for that day. If you need to eat more fat and calories, then make a quick cheesecake for dessert. Adjust the serving size to your specific calorie and fat needs by using the calorie breakdowns you will find at the bottom of each recipe page. The jam will go well with the Sopapilla Cheesecake, Low Carb Key Lime Cheesecakes, and Mocha Cheesecake Bars, while the maple syrup will be a delicious addition to the two keto pumpkin cheesecakes. To find out how you can fit these keto-friendly condiments and low-carb cheesecakes into your diet, you must first find your calorie and macronutrient needs by using our keto calculator. Once you’ve done that, we recommend tracking what you eat for a couple of weeks to get a better idea of how much you are eating. 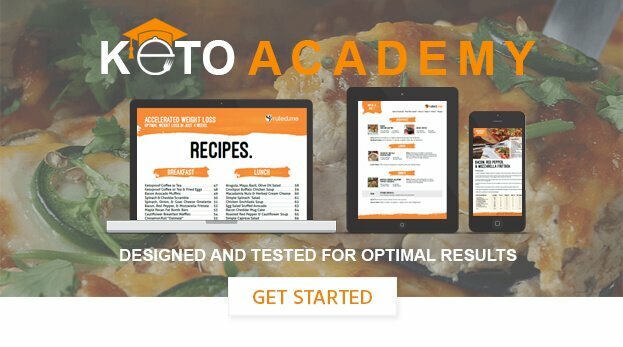 By tracking your calories, you will develop a better awareness of when it is a good idea to have some keto cheesecake and how much of that cheesecake you should eat. Follow this link to our guide on how to track food intake on keto if you need some further guidance. Having a keto cheesecake after your meal is one of the most delicious ways to add more high-quality fats into your diet without overdoing it on protein or carbs. There are many varieties of low-carb cheesecakes to satisfy all of your cravings without any of the guilt.